SUBHEAD: The crack-up of the U.S. global industrial, financial system has reached a new stage. 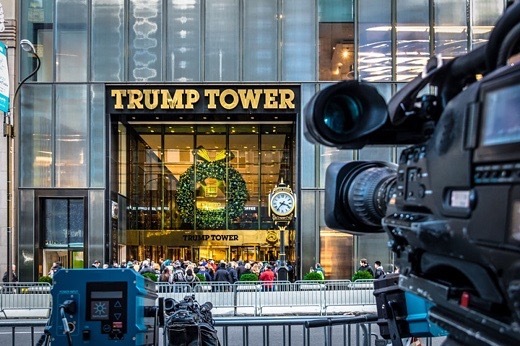 Image above: Entrance of Trump Tower in midtown Manhattan. Photo by Diego Grandi. From original article. Then, only a couple of days later, the new president insisted that massive voter fraud was responsible for the popular vote victory of his opponent, Hillary Clinton. Again, press secretary Spicer backed him up, and again the press called the claim (for which no evidence has been produced) a “lie” and a “falsehood”—terms that news outlets named above are not in the habit of using to describe statements issuing from the government’s executive branch. How will this tug of war play out? Don’t expect Donald Trump to back down; it’s not in his character. After all, he still hasn’t apologized for spending years promoting the “birther” fallacy, which held that Barack Obama wasn’t born in the United States and was therefore legally unqualified to be president—even though Trump later quietly acknowledged that Obama’s Hawaiian birth certificate is genuine. Rather than saying he’s sorry, Trump is far more likely to double down on his claims, counterclaims, denials, and accusations—as he is doing by insisting that all the women accusing him of sexual assault are lying. And he can draw some justification for his antagonistic feelings toward the press: he’s not alone in objecting to its unquestioning embrace of allegations of major Russian hacking in the election. First, the Trump administration will be tamed (which is highly unlikely) or discredited. As a result of media standing up to blatant falsehoods, all “serious people” will simply stop taking the administration seriously. The president will become an object of derision among an increasing share of the general public. Only a dwindling core of loyalists will soldier on as the Trump White House’s messaging hurls the Republican brand toward disaster. In the second possible end game, the president will find an excuse to proclaim emergency powers, then effectively shut down the mainstream media (this could mean putting them out of business or merely forcing them to toe the line). Press censorship is standard operating procedure in authoritarian regimes, and plenty of current (China, North Korea, Vietnam, Russia) or historic (Germany, Italy, the Philippines, Japan) examples could be cited. One bellwether of the concern that people have about this possibility is the factoid that George Orwell’s dystopian novel 1984—in which the fictional-future Ministry of Truth goes about its bureaucratic business of manufacturing a daily litany of falsehoods—now sits atop the Amazon best-seller list [link]. If this is the way things go, the media could be seen as playing into Trump’s hands, as they reveal which outlets, and which reporters, are friendly and malleable, and which should be the first to shut down when the appropriate time comes. On the other hand, a suitably severe crisis might lead the media simply to censor themselves, as largely happened in post-9/11 America. The managers at the New York Times and CNN are no doubt keenly aware of these possibilities, but their strategic options are constrained (partly by their own inside-the-box worldviews, and partly by their for-profit business models and their deep but mostly secret ties to the U.S. intelligence establishment). One way or another, we’re in for a big show—one that’s impossible to turn away from. Right now, many elites in the media, in politics, and even in the financial world are pining for the more stable business-as-usual of a Barack Obama or even a George W. Bush (never mind that nasty hiccup of a financial crash back in 2008). But that’s as much a denial of reality as Donald Trump’s crowd estimates or voter fraud claims. The crack-up of the U.S.-dominated global industrial-political-financial system has proceeded to a new stage (Donald Trump is symptom and proof of that), and there is no going back. What might be implied by “the way forward” in this context may be scary to contemplate. Unfortunately, much of that trajectory may be out of the hands of ordinary people: giant forces are at play, including political parties, intelligence agencies, national governments, major media outlets, financial conglomerates, and more. Most of the population will stand back and watch, petrified or thrilled but nevertheless transfixed. Many will protest and resist. Hopefully some who have managed to attain a big-picture understanding of the inevitable overall trajectory of the human project in this century (i.e., the end of growth and the need for resilient alternative economic arrangements) will continue the important work of building local cooperatives, of finding ways to meet human needs with less energy and material resources, and of wrapping the results in satisfying and inviting cultural experiences. In the long run, that’s the only work that will get us through the mess that lies ahead.